This is just north of Bunnahabhain, on the return from our walk to Bholsa. The ridge with the walker is at the foot of Sgarbh Breac on Islay, the Sound of Islay (not visible) just behind. 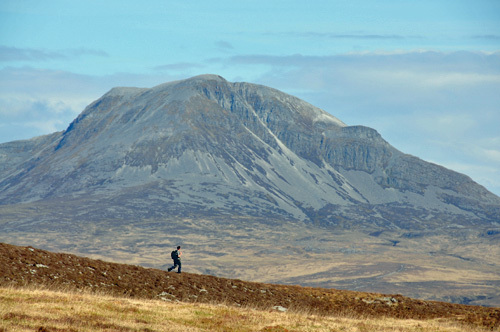 Providing an impressive background is Beinn an Oir, with 785m the highest of the Paps of Jura. As usual I will post a larger version on the Islay Pictures photoblog on Saturday morning. Have a great weekend, on Fèis Ìle or whereever else in the world you might be!